Fourth Row Center: Film Writings by Jason Bailey: On DVD: "True Grit (2010)"
So it turned out that the notion of the Coen Brothers remaking True Grit wasn’t such a stretch after all. 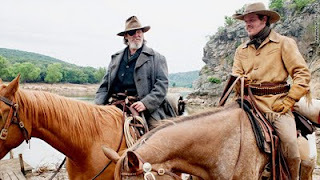 Marshall Reuben “Rooster” Cogburn may be one of John Wayne’s most recognizable characters, but as imagined in their 2010 adaptation (and played, expertly, by Jeff Bridges), he’s the latest in a long line of the Coens’ wonderfully loquacious heroes. Their films have always revealed a love of language, of its poetic possibilities and expositional powers; they are partial to men, from H.I. McDonnough to Charlie Meadows to Everett McGill to Professor G.H. Dorr, who take pleasure in the mere act of conversation—who talk, as it were, to hear themselves talk. The Coens enjoy the mere sound of dialogue, as evidenced by a wonderful moment early in True Grit that finds young Mattie Ross (Hailee Steinfeld) coming up the steps to the courtroom where Cogburn is testifying. She’s not close enough to hear the words, leaving us to make out only the gut-barrel grunt of his throaty tones echoing through the stairwell. Of course, the primary danger in remaking True Grit is in casting that leading role—what actor, no matter how skilled, wants to be compared to Wayne, a true American legend in arguably his most iconic role, the one that won him his only Oscar? But “the Dude” is more than up to the task of stepping in for “the Duke,” disappearing into a characterization more broadly comic but equally memorable, in much the same wickedly entertaining fashion. Hidden behind his scraggly beard, eye patch, and a considerable paunch, Bridges matches Wayne’s barrel-chested bravado, wrapping his hoarse Southern drawl around the endlessly quotable dialogue. His work is both enjoyably verbal and admirably physical; his deadpan cutaways become the picture’s comedic secret weapon. The story, as in the original 1969 film and Charles Portis’s 1968 book, concerns Mattie’s search for Tom Chaney (Josh Brolin), the no-good scoundrel who murdered her pa and took off into Indian territory with Lucky Ned Pepper (Barry Pepper) and his gang. She offers up a reward to Cogburn, whom she’s told is the meanest of the area marshals; he’s not receptive to her notion of coming along on the hunt, but her $100 will buy plenty of whiskey. Along for the ride is LaBouef (Matt Damon), a Texas Ranger who’s out to nab Chaney for the murder of a state senator. Much of the remake’s pre-release discussion centered on how far the it would skew from the original. The Coens made clear their intentions to go back and draw from Portis’s novel, but there’s plenty of dialogue shared with the original film, particularly in the first act. There are little changes in the staging throughout, however, which are mostly effective (relocating Mattie and LaBouef’s first scene to her bedside, for example, gives it a more personal, invasive undertone). The primary deviations are the addition of a couple of extra beats at the top of the journey (like an eerie/funny scene with a hanging man in the clearing) and the ending, which hews closer to the book’s bittersweet conclusion. Damon, in the lesser of the leading roles, is mostly content to play the background; he doesn’t try to muscle into the frame, instead maintaining notes of irritation and bemusement. Brolin—whose appearance is briefer than the ads would suggest—does an odd, eccentric turn, seizing on the notion that perhaps Chaney isn’t the brightest of bulbs. The film’s true discovery is Steinfeld, who stomps through the proceedings with force and gall, and has a real way with the Coen dialogue. Roger Deakins’s cinematography is predictably gorgeous, while the Coens’ editing (again under the non de plume of Roderick Jaynes) is tightly strung, right up through the thrilling, scary climax. The original True Grit was one of the last of a dying breed, a throwback to classic Hollywood filmmaking at the moment when that aesthetic was crashing down around it; the New Hollywood was sneaking right in, with Dennis Hopper, the director/star of that year’s definitive rebel movie, Easy Rider, popping up in one of Grit’s supporting roles. These days, the Western is even more of an anomaly, usually only seen in the form of yet another “revisionist” take. In spite of the humor of Bridges’s characterization and the dark vibe of its leaner moments, the Coens aren’t making fun of the genre, or making it into something that it’s not. As with their lean, mean lensing of No Country for Old Men, they’ve made a straight-forward literary adaptation that is respectful to its source and its traditions while still packing its own distinctive punch. This is an outstanding entertainment. "True Grit" hits DVD and Blu-ray today. For full A/V and bonus feature details, read this review on DVD Talk.